Feel good, lean back, enjoy summer and forget about the flies! Equimin natural fly protection contains almost exclusively natural active agents. The carefully developed formulation is regularly adapted to the latest scientific findings based on environmental conditions. Equimin natural fly protection reliably protects your horse for at least 6 hours from pests. By ordinary conditions Equimin is waterproof and sweat resistant. 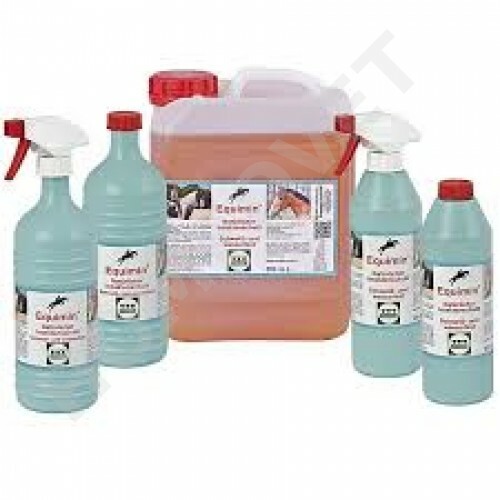 By ordinary conditions and used following the instructions on the label, Equimin is absolutely non-toxic and can also be used on very sensitive horses. It has been tested for skin tolerance and is regarded as very caring. Thanks to these properties it may also improve the well being of sweet-itch horses. Equimin is made only out of best raw materials that are subject to constant controls. Of course, Equimin is free of doping ingredients. Equimin bottles are refillable and the sprayers are reusable. We don’t use any unnecessary emulsifiers. That is why you must not forget to shake well before use. Spray Equimin sparingly onto the areas to be protected or use a sponge. In order to increase Equimin’s effectiveness out in the fields, let it work in and dry for a moment before the horses go out and are allowed to roll. Equimin’s slight odour vanishes after a few minutes so that it is almost odour-neutral. For sweet-itch horses with chafed areas Equimin should only be used after these spots have healed. Otherwise the natural oils could cause an unpleasant burning sensation on these spots. For the same reason please do not apply to mucous membranes. Concerning the special care of sweet-itch horses please also read the product description of Equibona care balm and Equidoux liquid against chafing.